Let's face it Donald Trump never wanted to be a real president. He was attracted to the position by the glitz and glamour, the appearance of superiority to other human beings, the ability to rub elbows with the rich and powerful, and to fire people. He thought it would be like the ultimate reality show, with him as center of attention and people hanging on his every tweet. But as for actual governing and policy making, he is not interested. He does not want to bother with daily intelligence briefings which are a bore. (Why hear the same thing over and over again?) He never realized that issues like health care and national security could be so complicated. And he had no idea it would all take so much effort and be so difficult! Running his one-man real estate business, with the help of his children, was so much easier. Due to all these reasons and more, his presidency so far has been a miserable comedy of errors. He has made one grievous error after another, the latest of which involved inviting the Russian diplomats (spies) to his office, kicking out all the American press, and then proceeding to spill classified information to the Russians. He has no clue his responsibilities and boundaries are. He does not understand his role or the consequences of his actions. He has no plan. The more time passes, the more obvious it becomes that there is the real potential that he will do serious damage to our democracy sooner or later. There is already talk circulating in Washington of impeachment, but given the spinelessness of the Republicans in Congress, it will be difficult to garner enough support for that to actually happen. And it's such a messy, long, drawn out process. He could do lots more damage in the mean time. 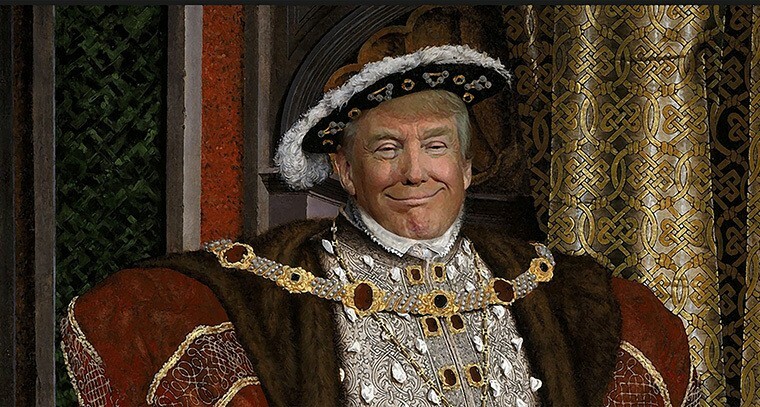 I have a better solution: let's make Donald Trump a one time only figurehead president, much like the royalty of England. He can live in the White House surrounded by all the opulence and air of importance that his ego craves and feeds upon. He can act as the welcoming committee to foreign dignitaries, posing for photo ops, sitting in the wing chairs before the fireplace, flying them down to Mara Lago to play golf and eat chocolate cake and lots and lots of ice cream. (One for you, two for me.) He can do all the "fun" things he envisioned he would be doing as president, without the bothersome responsibility. He need not sit through any more boring intelligence briefings. In fact, the less he knows the more secure our country will be. He doesn't need to hold any more press conferences and be asked impolite questions by nasty journalists. But who will run the government? Well, we have Mike Pence and Paul Ryan and Nancy Pelosi and Bernie Sanders. We have Congress. There are hundreds of people in Washington D.C. that have spent their careers doing just that. They'll do fine without him. 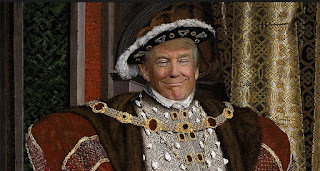 Just keep Trump busy golfing, eating cake and ice cream, watching himself on t.v., and "playing" President, and when he has time he can pop over and have tea with the queen.